MNsure, the state's new health insurance exchange, has been a flashpoint in this year's election from the top to the bottom of the ticket. 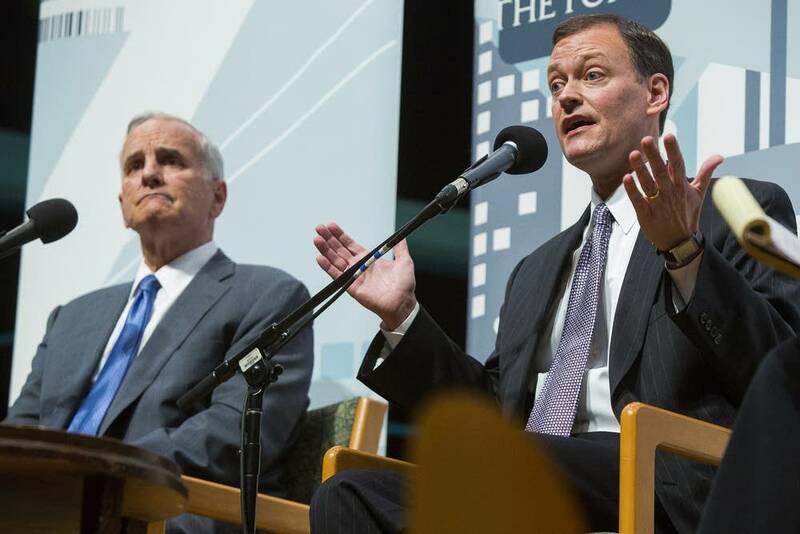 Republican gubernatorial candidate Jeff Johnson has repeatedly brought up flaws in the rollout and implementation of the exchange. Conservative groups are making MNsure an issue in Minnesota House races as well. A few weeks ago, Gov. Mark Dayton was able to defend the exchange when the Minnesota Department of Commerce announced that the average rate for plans sold on the exchange in 2015 would be 4.5 percent higher than in 2014, allowing Minnesota to keep its place as the state with the lowest cost premiums in the country. Johnson accused Dayton of lying, and many other Republicans said the actual rate increases would be much higher. With advice from the Kaiser Family Foundation, a non-partisan health care think-tank based in Washington that is a leading voice on the nuances of the federal health care law, MPR News ran more than 50 scenarios to test the truth of the Dayton administration's 4.5 percent claim. MNsure is the state's health insurance exchange, which was created as a result of the Affordable Care Act — Obamacare, as many people call the law. The exchange is targeted at people who don't get insurance through their employers. With a few exceptions, anyone who doesn't have insurance has to pay a fine, which gets heftier each year. The ACA recognizes that people who don't have insurance through an employer but make too much to qualify for public programs like Medicaid may still find monthly premiums too expensive. So, many people participating in the exchange also benefit from federal subsidies to help offset those monthly costs. When the Minnesota Department of Commerce announced rates would increase by 4.5 percent for 2015 open enrollment, they simply averaged the premium rate increase reported by each insurance company selling plans on the exchange. But that number focused only on how much more insurance companies are charging, a figure that is greater than the amount the many MNsure participants getting a subsidy will actually pay. 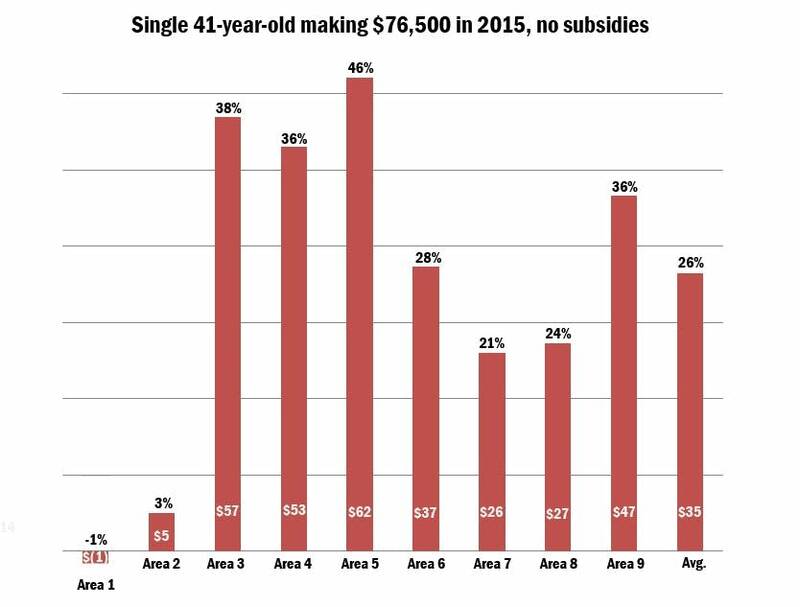 "The premium increases become a more nuanced story when you consider the subsidies people are getting," said Kaiser Family Foundation senior policy analyst Cynthia Cox who assisted with this fact check. To account for that nuance, MPR News looked at how much more it would cost people to buy an entry-level plan on MNsure — the minimum people need to spend to avoid a fine — with the help of a subsidy. You can read more about the methodology behind PoliGraph's analysis here. 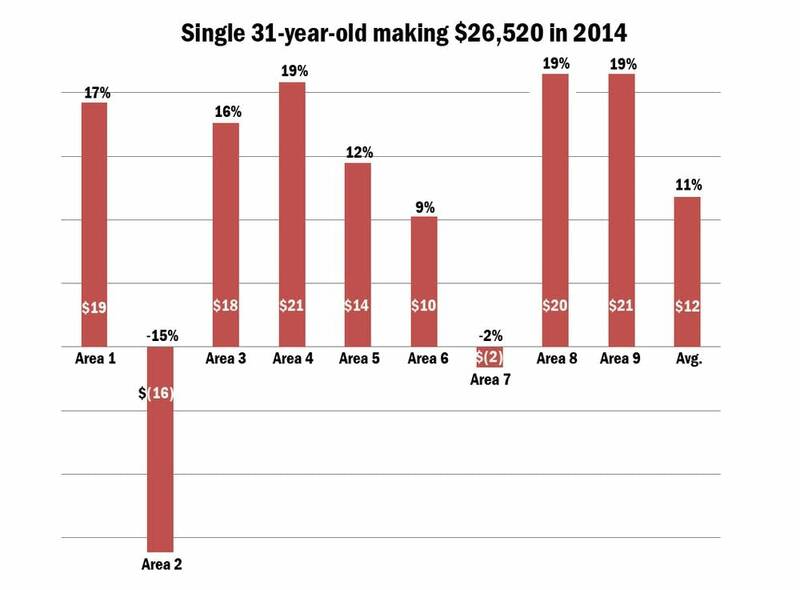 The bottom line: The change in monthly payments varies wildly depending on where you live, your income, your age and how many people are in your family. 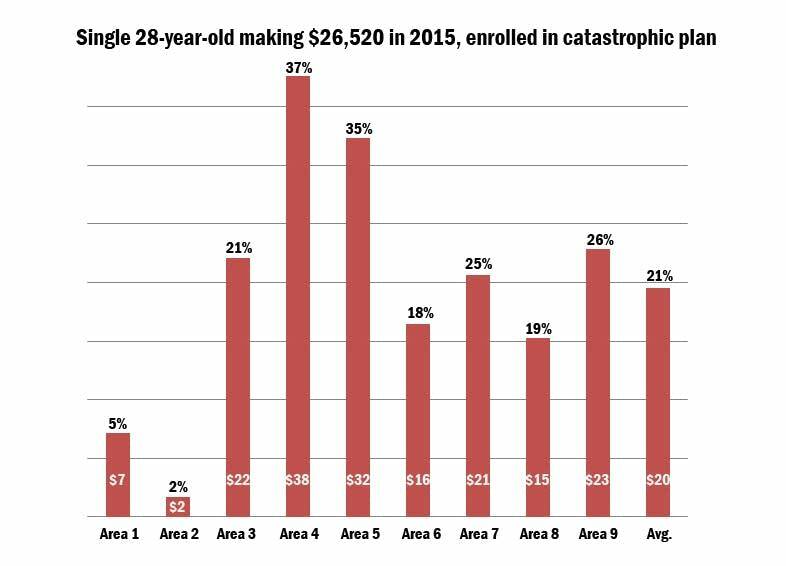 Take a 31-year-old making about $26,520 a year, who was 30-years-old in 2014 and making $26,000 when she enrolled in the exchange's lowest cost plan. If she lives in southeast Minnesota, she's going to pay about $19 more a month, which amounts to a 17 percent increase. If she lives in Duluth, she will pay $16 less than she did in 2014 — a 15 percent decline. 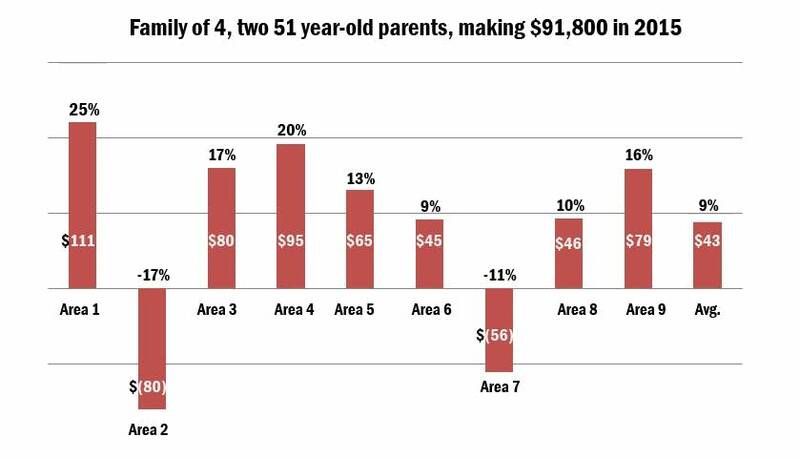 Meanwhile, a family of four living in southwest Minnesota that includes two children and two 51-year-old parents making a combined income of $91,800 annually will pay $95 more a month for their lowest cost plan — or about 24 percent more. 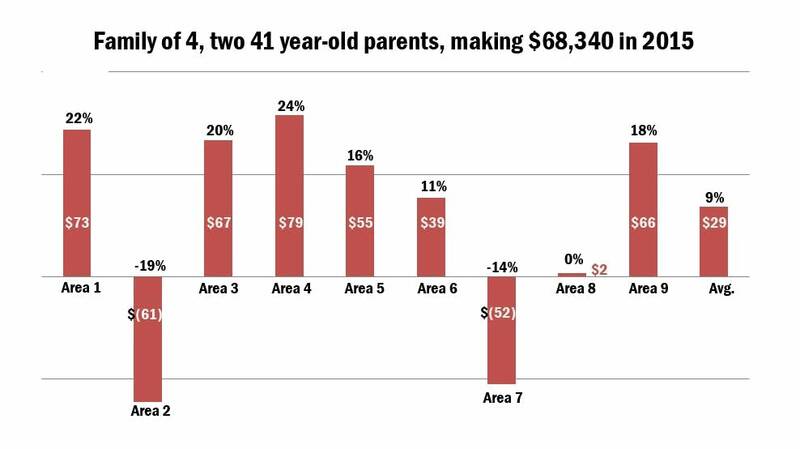 Move that same family to north central Minnesota, and they'll pay $52 less — or 14 percent less — than they did last year for the same coverage. Cox said that the numbers underscore the importance of shopping around for an insurance plan. What's clear is that costs are changing, and MNsure participants may qualify for a larger subsidy than they did last year. And according to the Minnesota Commerce Department, MNsure shoppers will have a wider variety of plans to choose from in 2015. In fact, Cox said a premium increase isn't as bad as it may seem. "Your benchmark premium going up means that, as far as subsides are concerned, health insurance is more expensive in your area," Cox said. "When that premium goes up, you become eligible for more help." The Dayton administration isn't technically wrong when it says MNsure insurance rates will increase by an average of 4.5 percent between 2014 and 2015. But that's an overly simplistic take on an extremely complicated set of facts. In reality, monthly costs for some MNsure participants will go down and others will go up by amounts often much higher than 4.5 percent. As a result, Dayton's claim that MNsure rates are only going up by 4.5 percent rates an inconclusive in this test.